Start with a sterile vase. You need the vase into which you place your delivery from the florist to be as clean as possible. Bacteria that gets into your bouquets can really decrease the length of time that they look great. There are several ways to clean your vases. You can wash it with hot water and soap but if you want to really get the vase sterile, you will use bleach. The cleaner you get your vase, the better. Your flowers need new water every day. 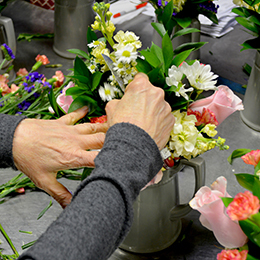 The single best way to keep the florist delivery looking bright and fresh is to keep the water fresh. Every day, you should switch out the water. Throughout the day, you should keep an eye on the water level. Flowers love water so the more of them that you have, the more water you are going to need. If you are not sure how much water your flowers need, some do require more than others, talk to the florist. Use filtered water from your kitchen’s refrigerator or brita filter. Most municipalities add a lot to the tap water. While tap water is going to work just fine for most cut flowers, the addition of fluoride and chlorine is not great for others. Some plants and flowers just do better when they are put in filtered water. If you are not sure what the best water is for your flowers, call the florist and ask. Many people have refrigerators that produce great filtered water, if you have that, you may just want to use that for your cut flowers. Read the rest of the article for the final 3 tips here: 6 Tips and Tricks to keeping cut flowers looking fresh.